Google is reportedly planning to reenter China by launching a censored version of their search engine. Although Google has yet to formally announce anything, all reports point to this being true. The platform was originally developed under the codename “Dragonfly” and was announced after leaked documents were published. Since the news broke the tech industry has been vocally opposed to this, with Google employees also speaking out. Although nothing has officially been announced, here is what we know so far. Google launched in China back in 2006. Things weren’t always smooth even back then. Google agreed to operate under censorship, believing that Chinese citizens should have access to some information even if they couldn’t access all of it. The company received backlash for this move but remained operating in China for a number of years. In 2009, China blocked access to Google-owned YouTube due to it showing clips of Chinese forces assaulting Tibetans. After that China began restricting access to services. Things changed dramatically in 2010 when Google announced they were pulling out of China in response to a Chinese originating hack. All search queries were directed to Google’s search engine in Hong Kong, which was not under China’s censorship laws. The online news site, The Intercept, published leak documents that announced Google’s intention to re-enter China. 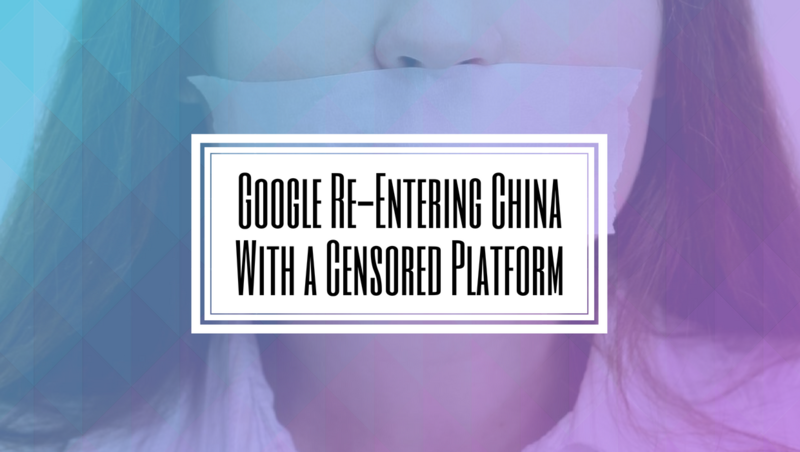 The document also outlined how Google was planning on complying with China’s censorship laws. According to the report, the search engine will blacklist sensitive searches and filter out websites blocked by the Chinese government. Information about topics such as political oppression, democracy, human rights, free speech, and peaceful protest are among the banned terms. It appears Google’s plan is to launch their Chinese version of its search platform on a custom Android app. This app will function similarly to Google’s regular search engine but will be a different platform. It will filter out the content that the Chinese government has deemed sensitive. The documents indicate that Google will carry out this project as part of a “joint venture” with another company, likely one based in China as all Internet companies operating in the country are required to operate their servers and data centers inside the nation. Although Google has not confirmed anything, the backlash has been swift. The general public has been actively criticizing the move online, with the tech industry being just as vocal. Human rights activists have also been those to cry out. Amnesty International stated that it would be a “dark day for internet freedom” and “a gross attack on freedom of information and internet freedom” if Google accepted China’s censorship terms. The backlash from within the company is even more severe. After the revelation of what Dragonfly was, anger quickly spread throughout the company across the world. Access to the documents was restricted, and with employees reportedly planning to protest the move. Some employees who were asked to work on the project declined, either transferred to different work or quitting, once they learned what it was for. Many employees view this new platform as a direct violation of Google’s previous statements on its stance on Chinese censorship and their principle believes that technologies should not be used to suppress human rights. This isn’t the first time Google has received pushback from within. Multiple employees signed a petition and threatened to quit after it was announced Google was planning to work the U.S. Pentagon on Project Maven, an AI project that would be used to improve drone strikes in battle. From Google’s standpoint, the risky move might be worth it. While Google is a household name across much of the world, even being synonymous with online searching, it doesn’t have nearly the same resonance in China. With China being one of the most desirable markets in the world, it’s understandable why Google would want to enter. Some Chinese citizens cheered the news on social media after it broke. Many see Google’s possible re-entry as welcomed competition to Baidu. While Baidu is extremely popular and its monopoly over Chinese social media has declined some, it has faced a few scandals recently. Although it’s understandable why Google wants to tap into the Chinese market, it’s not a smart move. The U.S. and China are currently in a trade war, with relationships being strained between the two countries. The level of pushback from all fronts should signal to Google that almost no one is supporting this move. It should also be questioned what use a heavily censored Google even has. Baidu has the market share in China, and its unlikely Google will be able to compete with them. A censored Google won’t provide Chinese citizens with anything they don’t already have. Google should ask itself whether what they hope to gain is worth what they will certainly lose, which includes the respect of nearly everyone.